An all-new innovative product that is brewed with subtle spicy hints of clove, coriander, and orange peel becomes the latest addition to join Tiger’s expanding portfolio. Aptly called Tiger White, the wheat beer comes to fruition two years after the brand unveiled its innovative beverage Tiger Radler, a variant that combines the crisp and easy-drinking taste of Tiger Beer with the zesty flavour of natural lemon juice. The introduction of White proves once again that Tiger Beer does not rest on its laurels and constantly pushes the boundaries of innovation, to create fresh and exciting brews for its consumers. 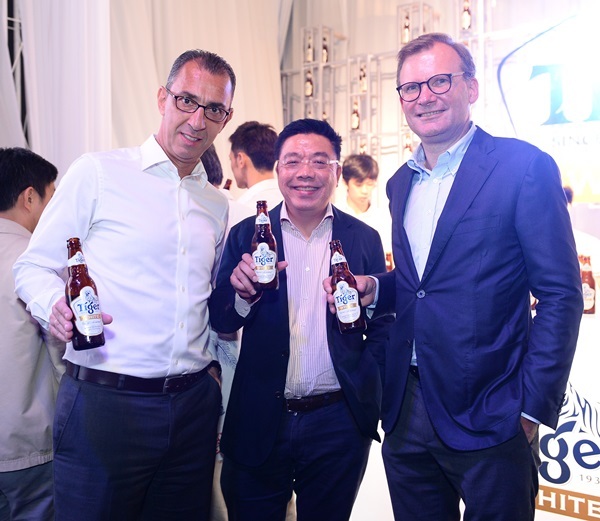 Speaking at the launch to members of the media, Guinness Anchor Berhad managing director Hans Essaadi said: “In 2013, we reinterpreted a popular European-style drink with Tiger Radler, which has proven to be a popular choice that appeals to both beer and non-beer drinkers alike. Following the success of this variant, the time has come for us to provide our consumers with a new refreshing option; an option we’ve identified resonates well with them – wheat beer. Right now this drink of choice is mostly imported, making it an ideal market for us to tap into, and by brewing it locally, we refresh this wheat beer category as we increase its reach. “With the launch of Tiger White, we demonstrate we have the tenacity to expand our portfolio, and increase market share as we make this premium brew more accessible to all consumers. Similarly, the launch today further solidifies Tiger Beer’s market leadership in Malaysia as Tiger White makes its first appearance here before anywhere else in the world,” Essaadi said to an intimate group of business and lifestyle media at the launch held at the Black Box in Publika, Desa Sri Hartamas. The all-new cloudy, wheaty variant with an ABV of 5% is making its way to various bars and stores across the country. Also announced at the event was an initiative that Tiger White kick started in October in conjunction with the product’s campaign tagline — “It all starts with white”. Mooted on the notion that all creative ideas begin on blank spaces, the initiative beckons consumers to put on their artistic hats for a chance at being a part of the first crowd-sourced movie production done entirely via physical and digital beer coasters. These serve as entry forms to those brave enough to volunteer themselves or to nominate friends for available roles anywhere from screenwriters to hair stylists to actors or even on-set masseuses. The short-film production will be mentored by Baltasar Kormákur, the director / producer behind blockbuster hits like Everest (starring Jake Gyllenhaal and Keira Knightley), 2 Guns (Denzel Washington and Mark Wahlberg), and Contraband (Mark Wahlberg). Tiger Beer marketing manager Jessie Chuah said, “Every great creative concept starts on a white canvas and from the courage to begin. It is with this notion we derived at Tiger White’s tagline – ‘It all starts with white’, which to us was the fearlessness to brew wheat beer in the heart of Asia. “Subsequently, we see ‘It all starts with white’ as a philosophy — a blank slate and the valor to turn passion into bold actions. Therefore, we urge Malaysians to unleash their creativity for a chance at being a part of a film production like none other,” Chuah told the media. Have you tried the new Tiger White? I have, and I must say it's really good! For more information on Tiger White, visit www.tigerbeer.com.my.